The property has an extensive garden to the front which means the house is quite a bit back from the quiet, country road. From the road, we enter to the left of the plot which has a gated entrance with a long paved driveway up to the property. At the top of the driveway, there is an open fronted garage to accommodate 2 cars. To the right we have the house. To the front of the property is the swimming pool, BBQ and summer kitchen. The kitchen has a lovely stone sink and a fitted fridge. This space is perfect for parties and gatherings as there is also an outside shower and toilet, which means that entering the main house is not necessary. Going through the front door, we are lead into a lovely open space living room with high ceilings and patio doors to the front porch. The living room has a lovely flow through to the dining room and then round into the kitchen. The kitchen has wooden wall and floor units and fitted appliances. Here there is also a door to the exterior. Going back through into the living room and then round the corner into a long corridor which has the three bedroom, family bathroom and pantry/utility room. The property’s three bedrooms are good sizes and all have built in wardrobes, two have laminate flooring and the master has a parquet floor. The master has an en-suite, with shower cubicle and patio doors out onto the patio. The family bathroom is spacious and light. There is a large bathtub with a shower over the top. The laundry room/pantry is across the hall from here. The property has a lovely and homely feeling as soon as you walk through the door and even outside at the pool area, it feels very relaxed and a great place to unwind after a long day. The property comes with 3562sqm of land which is all walled and fenced. The property has city water, a bore hole and auto irrigation system. There are a few cafés and restaurants in the area also. 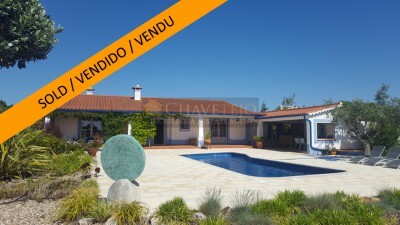 The house is situated in a village called Boca da Mata which is around 9km away from Tomar. The historic town of Tomar is home to the UNESCO listed Convento de Cristo. Tomar is a popular and bustling town with a variety of restaurants, cafes, bars, historic monuments, schools, university, bus and train station and hospital.